I am pooped. With a capital "P". No, wait. Make that a capital "OOPED" as well. Will and I decided that New Years Eve was the perfect opportunity to drive the more or less 500 km to Kathu; pack up my entire flat; squeeze everything onto a tiny little trailer; and drive the 500 km back home. In one go. Boy, was it a fun day. Having said that, being pooped is not at all what disturbs me about this whole exercise. Neither is traveling 1000 km in one day. What disturbs me, is the "stuff". Heaps and heaps of "stuff" that I neither use, nor need, but still lug around with me because I'm too _____________ to let it go. (Sentimental? Scared that I'll need it again someday? You fill in the blank.) And I'm not talking heaps and heaps of dust gathering little ornaments or unusable stuff - those I've stopped gathering a long time ago. I'm talking about way too many kitchen appliences that rarely get used; stacks of clothing that never get worn; racks full of books that are only read once... Man, this stuff's got to go. Lots and lots of "stuff". So, in line with my word for 2012, I'm choosing to let the stuff go. This week will be spent sorting, selling, donating, blessing and giving away. We are trying to pare things down too! We have far more stuff that we could ever need, and with 6 of us living in our house, we have to get rid of some of the excess!! I love getting rid of stuff! 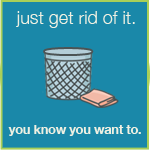 Good luck cutting down the clutter. I have been trying to do a lot of that lately. Too much stuff! With you on that. Christmas tree gets packed away tomorrow, clearing out my craft room and office too. Thursday will be clearing the office. Hello fellow Tough Chik! I'm thinking our house needs some purging too. I don't know how we end up with so much stuff. Looking forward to dropping some stuff off at our local thrift store! Thanks for following my blog! I just did the same...spent a few days tossing out stuff we just really didn't use. Felt good to purge and start fresh! The same here, too many stuff. And I am sorry, also "vintage" running clothes in cotton. But I will always take with me the outfits of the Running Navy Team: great and unforgettable memories.